CAD models often lack quality and precision required by the complex engineering processes (CAD -> CAE -> CAM). The geometrical and topological flaws are main obstacles in data translation. Complex CAD operations as model re-scaling, offsetting or Boolean operations are impossible to perform on invalid models. Repairs in native CAD system are in general difficult and time consuming as CAD system are not designed for this purpose. 3DTransVidia offers ultimate solutions to repair existing 3D CAD models to desired quality. Geometry check tools verify model compliance against the automotive industry standards as VDA 4955-2, JAMA and AIAG D-15 or user defined quality criteria. The automatic repair resolves over 60 typical geometry and topology conflicts. The repair is performed within a specified model tolerance without changing or deforming the original model. Even an inexperienced CAD user will complete the repair within very short time. 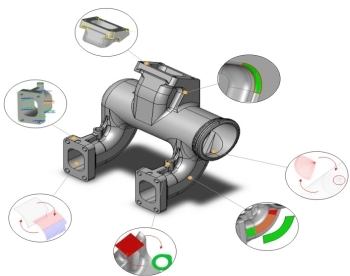 3DTransVidia automatically classifies types of errors remaining in the model after automatic repair and suggests a most suitable manual repair workflow. Problematic places are visible in the project tree and remain there until they are fixed. The repair parts are automatically merged with the rest of the model. Manual repair has never been simpler. 3DTransVidia provides a workflow and special tools to easy and fast repair all remaining problems. Faulty places together with their neighbours are automatically isolated form the rest of the model. The user manipulates only on small part of the model instead of the whole model or complex assembly. There are specialized repair functions for fast and easy repair of the most complex problem.